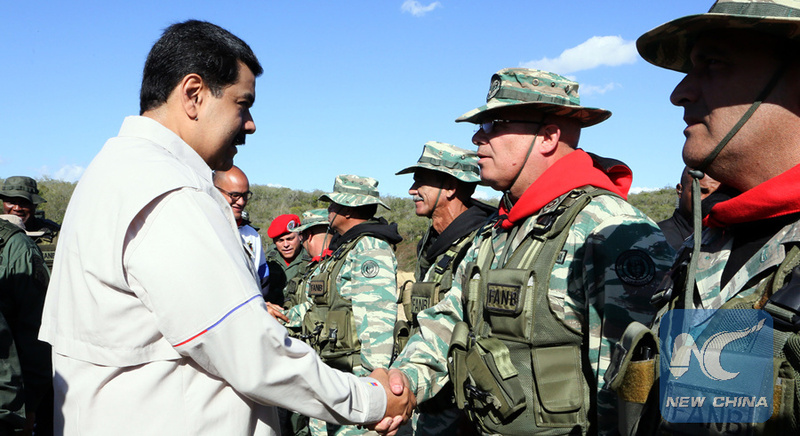 Venezuelan President Nicolas Maduro (L) greets a soldier at the Guicaipuro Fort in Miranda, Venezuela, on Feb. 10, 2019. MOSCOW, Feb. 12 (Xinhua) -- Russia has prepared a United Nations Security Council (UNSC) draft resolution supporting dialogue in Venezuela, contrary to a U.S. proposal that paves the way for an invasion, Russian Foreign Minister Sergei Lavrov said Tuesday. "Some U.S. officials and Venezuelan opposition leaders claim that our resolution is aimed at disrupting so-called humanitarian actions planned by the United States and its allies," Lavrov said at a press conference. Lavrov said mis-characterizing Russia's draft resolution is an attempt to divert attention from the U.S. version "which in essence aims to use the delivery of humanitarian aid as a means of destabilizing the situation in Venezuela and creating a pretext for direct military intervention." The UNSC will never accept such a resolution, Lavrov said. Lavrov says Russia supports the initiative of Mexico and Uruguay on creating conditions for national dialogue with the participation of all political forces in Venezuela, he said. Although Venezuelan President Nicolas Maduro immediately expressed readiness for dialogue, the opposition rejected this proposal on the instruction of U.S. representatives, who have "lost all sense of shame," Lavrov said. Russia, China and some other countries expressed readiness to take part in a contact group created by the European Union to foster discussion, but so far there has not been any constructive reaction from the bloc, Lavrov said. He said the contact group, created with some Latin American countries, has approved a document, which is "in general aimed at unilateral support of the opposition." He said he planned to meet EU diplomacy head Federica Mogherini in the coming days to discuss the EU position on Venezuela. The top Russian diplomat said he also intends to have a phone conversation with U.S. Secretary of State Mike Pompeo later on Tuesday.